Colorful Paper Prints Using Shaving Cream & Food Coloring! | Happy Deal - Happy Day! 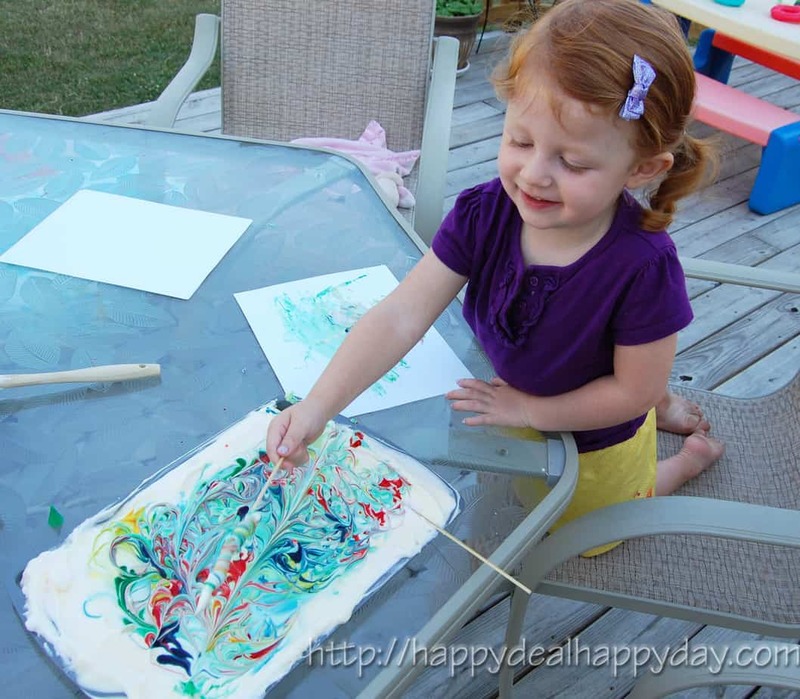 Colorful Paper Prints Using Shaving Cream & Food Coloring! Are you ready to learn about a cool craft idea you can do using shaving cream and food coloring? I will show you how to make a colorful print on blank paper with these materials! We had tons of fun at our house last night doing this. First what you need to do is spray on the shaving cream/gel onto a cookie sheet. Spread it around until its even like frosting. Add a few drops of food coloring as a background color for your print. I chose yellow as it is the lightest. You will layer other colors on later, so start with a light color first. Then I added on some drops of blue and used the skewer to swirl around and make a fun pattern with the color. Here is the fun part! Place a piece of paper onto the shaving cream and press down until all of the paper is touching the shaving cream. Then slowly peel off the paper. The color on the cookie sheet will be left smeared, like in the picture above. Ready to be mind blown??? Scrape off the shaving cream that is on the paper, revealing the pattern print. You will be amazed at the design that appears under the smeared shaving cream!! Trust me – you gotta try it! After we made a print with just blue, we went back and added more colors and made many more prints of fun food coloring swirls. My 2 year old is having a blast helping me swirl the colors. Is this messy? You bet! We did this project outside, and just hosed off anything that was covered in colored shaving cream when we were done. But I don’t want to scare you – I think it was only super messy with a 2 year old. If it was just an adult working on this, the mess will be minimal. Is it a blast! Absolutly! Who cares if you get a bit messy! Have some fun with your kids with this inexpensive and cool craft that can be done outdoors. This is a super cool craft that is fun for the whole family! If you try this, come back and share some pictures for possible posting! If you also have an idea or craft you’ve completed using an item you’ve gotten dirt cheap/free using coupons, send them my way as well! 28 Responses to Colorful Paper Prints Using Shaving Cream & Food Coloring! Stopping by from Tip Junkie! Great idea! I am going to try this to make wrapping paper! I use to make wrapping paper and other art from colored bubbles…I am sure this will have a similar result! Love it, Maura!!! Great idea! My kids are gonna love this! I’m hosting a linky party “One Creative Weekend” at OneCreativeMommy.com. I’d love for you to visit and link up this idea and/or anything else you’d like to share. wow i make like 7 to 8 real cards to mail out to ppl who need careing kind word some fighting cancer some lost the loveone to cancer and still send the famiy a card some in nurseing home who need hear there loved soi am so happy wheni see something differ i to can share with them . so thank you so much i be pining and shareing this . may you all have blessed new year in 2015 trying tink about what send 12 speacil men for valtimeswho severing over sea not sure what do this year i sure it come to soon it better cause it got be maked and mailed soon for them get by valtimes . I love this! Your card is so pretty and I love that picture of the prints drying in the sun. This a project I’m going to have to try–didn’t realize it was so doable. Thanks for sharing! Your card is so gorgeous, and I have that same washi tape, so I may need to copy you. 😉 Thank you so much for sharing at Best of the Weekend! I used this same technique to decorate the cover of a bare book. If you don’t know about bare books, just google barebooks.com. You can order very inexpensive bound, hardcover books for just a few dollars each. I use the bare book for scrapbooking. I teach 9th grade, and I made a memory book for last year. I would post a picture, but I’m not computer savvy enough.